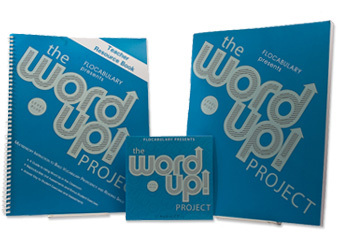 The Word Up Project: Level Blue directly teaches 210 vocabulary words to increase students’ reading and oral comprehension, vocabulary, and writing ability. The units teach word meaning through a series of increasingly challenging exposures, including a reading passage, a fun analysis of Greek and Latin roots and an opportunity to put the words to use. The Teacher Resource Book contains a complete guide to using The Word Up Project in the classroom, including lesson plans, additional activities and reproducible tests for each unit. Written at an 8th grade reading level, this title has been used with students in grades 6 to 12 and is proven to raise state test scores. In a shack about the size of a corridor. You can read more about it in his memoir. But she fostered, encouraged his musical skills. Given again and again till they’re sinking in. That he wore all the time, and times were tough. But the way Ray plays is Ray’s way. You should have seen him on his pay day. But Ray demanded that they pay him in ones. And trick Ray, in case Ray got less than the rest did. Was to be the brightest light you’re seeing at night. He sang a little melody, and piano-played. Just a lil’ R&B in a Gospel way. Went beyond them; man, it’s off the wall. With so much food that you’re dying to eat. And Ray could pound the keys with the best of them.